Getting players to look up is notoriously hard. The best which most video games actually manage to accomplish is getting them to look down. Think about the towers in Breath of the Wild or the latest Assassin’s Creed. Remember marking those waypoints, objectives, and collectibles? These adventure games were at least able to find some use for the z-axis in their gameplay mechanics, but this really isn’t the norm across genres. There’s one in particular which continues to resist verticality: RTS. How many real-time strategy games can you name which make use of a truly 3D environment? The majority consist of one or more planar gameplay surfaces. Rise of Nations, Age of Mythology, and Supreme Commander immediately spring to mind. Empire at War even featured starships, but never took advantage of the movement affordances provided by outer space. The only real-time strategy game to fully embrace verticality was released back in 1999: Homeworld. 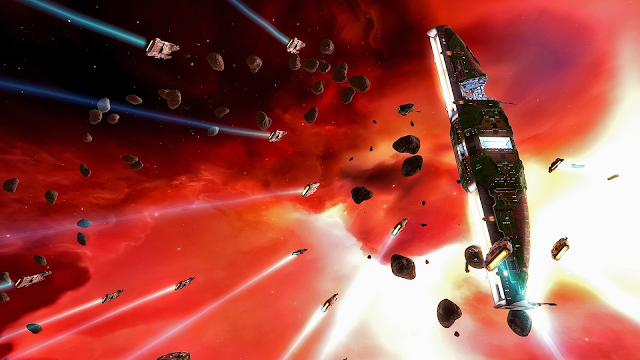 The developer behind Homeworld, Relic, released the game to widespread critical acclaim. (GameSpot even figured that it “may well reshape the entire real-time strategy genre” through its movement mechanics). The stand-alone expansion, Cataclysm, came out a year later. Relic made a full sequel in 2003. 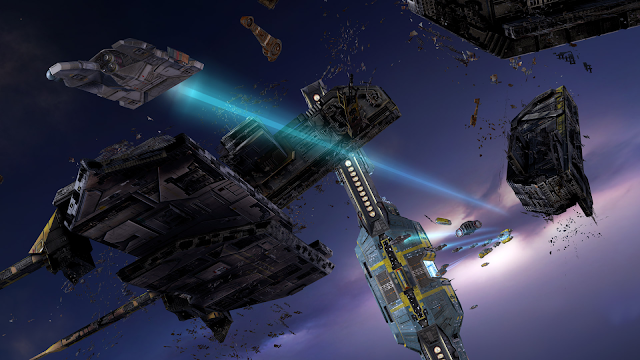 Raising concerns that Homeworld might be in for troubled times, the future of the franchise fell into question about a year later when Relic was acquired by THQ. There would be almost no mention of the series for a decade. With many fans giving up hope for another Homeworld game, THQ came into financial difficulties and declared bankruptcy in 2013. The pieces were picked up by Take-Two, Activision, Ubisoft, and a company known mostly for the Borderlands franchise: Gearbox. With the rights to Homeworld in hand, Gearbox went on to publish the Remastered Collection in 2015 and a prequel, Deserts of Kharak, the following year. Now, let’s talk about what makes Homeworld such a special game. Thinking in 3D changes your approach to strategy. Making use of the z-axis requires a very different kind of spatial reasoning which impacts even simple tasks like resource collection. In video games like Warcraft 3, players are taught to think about resources in terms of their absolute position. This encourages them to mentally break down the map into a series of control points. Relic threw this out the window. Resources in Homeworld exist in 3D space where absolute position matters less than relative position. Since the primary objective is to protect your mothership, the most intuitive strategy is to keep this vessel outside of the game’s resource-rich asteroid belts. This takes collectors far away from your fleet’s protective cover, though. You have three options if they come under attack: go all-in, divide forces, or focus on exploiting a different asteroid belt. Each one entails different levels of risk for the mothership. Keeping it safe usually ends up taking priority. Homeworld’s use of the z-axis impacts a lot more than just resource collection. The game’s verticality for example makes you deploy ships differently. 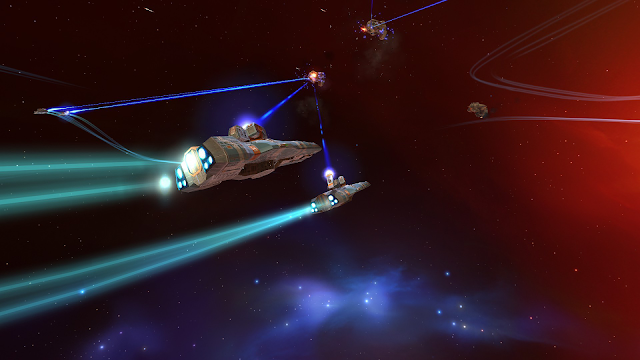 Homeworld uses gameplay mechanics like environmental damage to require that players move their units through arching dust clouds. These arches mean that straight paths are never safe ones. You need to be careful about keeping units within these dust clouds or else you’ll probably end up ordering them into unprotected parts of the game world. This often requires attention for detail. The level designer behind Super Nova Research Station even put several of those resource-rich asteroid belts away from the main dust cloud. Set your collectors to Auto-Harvest and you’ll soon shriek as they start exploding! These dust clouds turn up in Homeworld 2, but sticking to them is stealthy — straying too far from their protective cover alerts the enemy. Losing track of where you deploy a ship can easily cost you. Real-time strategy games have been modeling directional damage for decades. Delivering more damage from the sides, rear, and top should be familiar by now to any gamer, but Homeworld’s take on the feature still seems fresh. Homeworld’s verticality opens up tactical opportunities which seem contrived in most other games. Calling down artillery in Company of Heroes or World in Conflict is definitely satisfying, but something about it still seems hollow in comparison to maneuvering ships in Homeworld. Even games like Ashes of the Singularity which include both ground and air units tend to spoil the fun by relegating each of these to a separate gameplay surface. 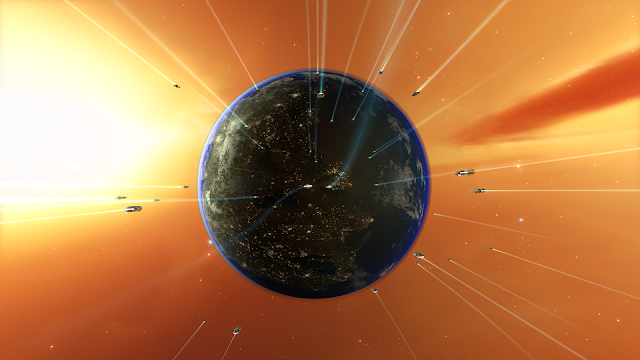 Homeworld’s Building Modules provide a strong counterpoint. Introduced in Homeworld 2, these took the form of targetable attachments on capital ships. Blowing up a carrier’s Fighter Module for example will stop it from churning out any attack bombers. These are physical additions to a capital ship, so you can’t just go at them from any angle, though. You have to purposefully move units along the z-axis. So, did the game “reshape the entire real-time strategy genre” through its movement mechanics? With nearly two decades of retrospect, it’s clear that Homeworld’s approach to 3D space never made it past Homeworld 2. Real-time strategy games like Sins of a Solar Empire could have introduced movement along the z-axis, but you’d be hard-pressed to find any which have. Even the most recent entry in the Homeworld franchise, Deserts of Kharak, went back to a system of planar gameplay surfaces. Why didn’t such a brilliant idea catch on? Homeworld’s movement mechanics introduce a learning curve which takes you a long time to fully overcome. You have to right-click for bearing and left-click for elevation. It’s deceptively simple. There’s something about a truly 3D environment which alters our sense of perception and fills us with feelings of anxiety and confusion. Have you ever tried to land on a space station in simulators like Freelancer, X Rebirth, or Elite: Dangerous? People intuitively think in terms of planar surfaces. In other words, we almost never look up.